Chasing Fireflies The Ultimate Collection Live-Action Belle Ball Gown was perfect for our visit! Planning a visit to the Happiest Place on Earth and looking to capture some fun and memorable photos? I've got a list of my top 10+ places to get that clever and iconic picture so you can get back to making amazing family memories the ones only Disney can help you create! I'm ecstatic to be offering up a giveaway to help you on your way to that perfect picture, enter below for a chance at a pair of "Sally Ears" as well as a $15 Disney gift card to spend at the parks! 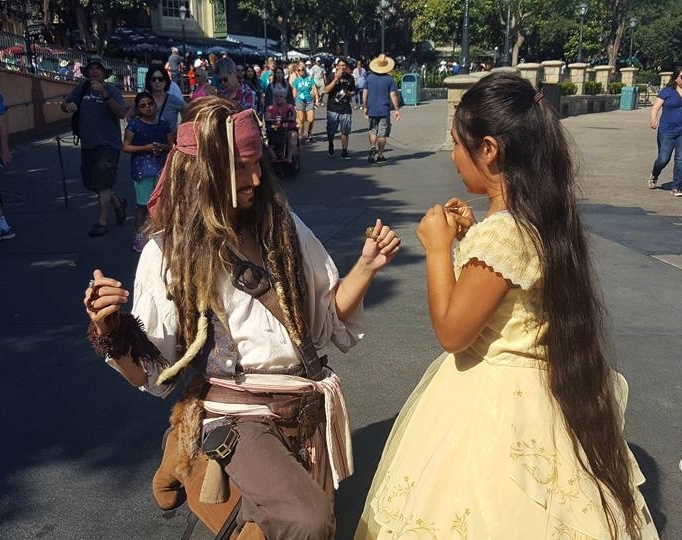 As a Disneyland Resort annual pass holder (aka AP) for almost 5 years now, we have the luxury to take our time when visiting the Disney properties, switching it up between the parks, rides, shows and the pursuit of the perfect princess photo meet up. For the families who visit maybe once a year it can be a long and busy day trying to squeezing everything into a day or two. I'm sharing my favorite spots and opps for pictures at the parks PLUS you can finds several more Nikon Picture Spots via the official Disneyland Park app. Fit for both a prince or princess, these places within Disneyland will help you create those memories that will last a lifetime... or until your next magical visit! My daughter with Belle in her Chasing Fireflies Dress, she still loves dressing up for her visits. Sleeping Beauties Castle: Iconic and timeless! It can be very crowded front and center, I prefer taking our pics from either far right (near Snow Whites wishing well) or far left near the fantasy faire. These spots will get you a perfect picture without all the unwanted extras. Main Street balloons: Just kindly ask and hold on! CM's are always accommodating between selling their merchandise. Makes for a super fun photo! Royal Hall Character Experience: This one has posted wait times but you will get to meet 3 princess all in their separate vignettes, a great way to get signatures and pictures plus some magical one on one time. There is also normally a princess just outside the line up area as well (check app for character and times). Located just to the left of Sleeping Beauties castle off Main Street U.S.A.
Star Wars Launch Bay: There you will have a chance to meet Darth, Chewbacca and even Ren Klyo (characters vary, see app for times) They have their own areas creating a special one on one meeting for you die hard Star War Fans! Located in Tomorrowland. Disneyland Entrance: Upon entering the turnstiles, get your picture in front of the railroad station and it's beautifully landscaped Mickey backdrop. Walt Disney and Mickey Mouse Bronze: Get a picture with the man and the mouse that started it all. Located at the end of Main Street U.S.A in front of Sleeping Beauties castle smack center in the round about. The Sword and the Stone: Are you the true king of Camelot? Try your luck at pulling Excaliber from the stone! Located directly in front of King Authors Carousel in FantasyLand. King Arthur's Carousel: In the heart of Fantasyland, it's a perfect picture opportunity for your knight or princess. Snow Whites Wishing Well: To the right of Sleeping Beauties Castle there is a quaint Grotto with Snow White and her seven dwarfs. The bonus with the wishing well is that echoes Snow White as she sings. This is also a designated princess meet and greet area (see app for times and characters). Pixie Hollow: On the right of Sleeping Beauties Castle is another great opportunity to get several character interactions within one spot. There can be up to 3 fairies there available for pictures inside Pixie Hollow and they always make for fun pictures. Some of our best and most precious pictures have been from the random encounters within the park. Spontaneous and unstaged run ins with our beloved favorites in my opinion are.... The best! Random character run ins our are favorites! We just LOVE Disneyland and everything Disney! I will continue to be an AP till my little princess grows tired of going, who am I kidding... that will never happen! Enter below for a chance at a Pair of "Sally" Ears and a $15 Disney Gift Card to help you get that perfect shot in the park. Faith, Trust and Pixie dust to you all! Below are some more Disneyland Posts you might find useful!